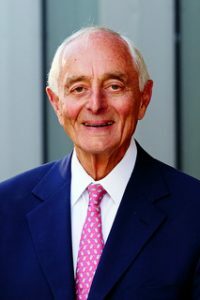 The gift, announced Tuesday, will be added to a $1.5 million endowment gift made by the Lubars in 2010, to create a $7 million fund for continuing support of the efforts of the Law School. The public policy initiative began in 2007 with the hiring of Mike Gousha, distinguished fellow in law and public policy. It has grown to include numerous conferences, candidate debates, the “On the Issues with Mike Gousha” series of conversations, the Marquette Law School Poll, the Water Law and Policy Initiative, and other efforts to further serious, balanced discussion of major issues of all kinds. The initiative will be named the Lubar Center for Public Policy Research and Civic Education. In addition, the Appellate Courtroom of Eckstein Hall, where many major events are held, will be named the Lubar Center. The Lubar Center will support public policy research initiatives and civic education at the Law School and beyond. This includes public events, funding for faculty and staff involved in the center, and research and reporting projects. The initial Lubar gift has supported numerous research projects and innovative partnerships with journalism entities, including the Milwaukee Journal Sentinel and the Milwaukee Business Journal. In addition to the Lubar Fund, the Law School supports its public policy initiative with donations from its annual fund. The full news release announcing the gift may be found by clicking here. This is indeed good news! We have gotten so much excellent information attending “On the Issues.” We appreciate the Lubars’ thoughtfulness and offer continuing good wishes to all at Marquette Law who sustain this initiative. Congratulations to all.